Lock in a great price for Hotel Sintra – rated 8.2 by recent guests! The Sintra is just right. We love Macau, and have stayed in far bigger, far more expensive hotels, and just felt ignored, swamped in their shopping mall scale. This smallish hotel is just a very comfortable size. It's kind of old world classy, not vulgar - which is not something you can say about many Macau hotels. The rooms are a good size and always immaculately clean. The location is great - kind of overlooking the most popular spots. And across from Macau's biggest ( smartest ) department store. Also, on a personal note: - when the shuttle bus to the harbour drove past us - the manager himself came out and ordered it back. We travel a lot - and stay in lots of hotels - this for me is one of the best managed we've ever stayed in - and this is perhaps our sixth stay in the Sintra - and I can't really say I have a bad word to say about it. Almost everything. Staff, W-fi, AC, the size of the room, bed and bathroom, the cleanliness, all good! The breakfast buffet was nice, a lot of options, just one bad thing about it that I`ll write on the "didn`t like" space. The location is great! Location is so convenient. Amenities are excellence. Staffs are helpful. Hotel location is easy to spot. Has reasonably good view out of the window. Location is perfect for walking to sights including the Ruins of St. Paul, the historic Portuguese quarters, and all the food stalls/bakeries. There is a shuttle that brings guests from the Macau Outer Harbor Ferry Terminal (when you walk towards the row of shuttle buses turn left and there will be a bay for the shuttle. If you don't see it, take the shuttle to Hotel Lisboa- it's a 5 minute walk to Hotel Sintra). Very convenient location. Staff was very helpful. 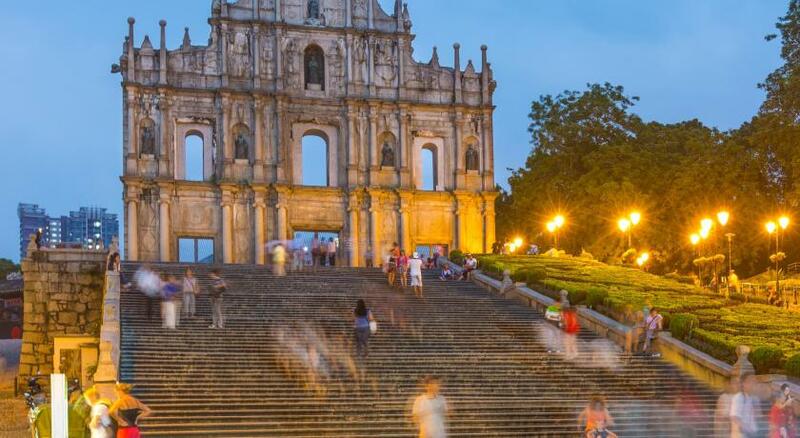 Location is good, within walking distance to Ruins of St. Paul, Senado Square, Macau Museum, and nearby hotels and casinos such as Wynn Macau, Grand Lisboa, MGM, and others. Excellent room and restaurant. The location is great, within walking distance to the main attractions. Hotel Sintra This rating is a reflection of how the property compares to the industry standard when it comes to price, facilities and services available. It's based on a self-evaluation by the property. Use this rating to help choose your stay! Located a 10-minute walk from Senado Square, the Hotel Sintra has luxurious, air-conditioned rooms, free Wi-Fi and an on-site restaurant. A free shuttle bus service to Macao Maritime Ferry Terminal is available. The traditionally-decorated rooms include carpeted floors and wood furnishings. The rooms include a flat-screen TV, sitting area and private bathroom with a hairdryer. A refrigerator and electric kettle are also provided. 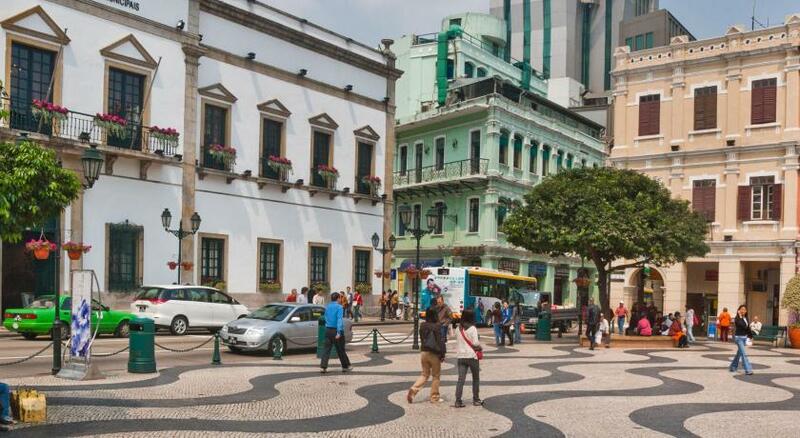 Hotel Sintra is 950 feet from the Holy House of Mercy and Leal Senado Building. Macau International Airport is a 20-minute drive away. When would you like to stay at Hotel Sintra? Featuring air conditioning, this room comes with a flat-screen TV, refrigerator and electric kettle. The private bathroom offers a bath, shower and free toiletries. Slippers are provided. This large air-conditioned room comes with a sofa, flat-screen TV, refrigerator and electric kettle. The private bathroom offers a shower, bath, free toiletries and a hairdryer. Slippers are provided. Please note that for breakfast inclusive rate, it only includes breakfast for 2 people. Extra charges will apply if the 3rd guest wish to dine breakfast. This air-conditioned room comes with a flat-screen TV, refrigerator and electric kettle. The private bathroom has a shower, bath, free toiletries and a hairdryer. This air-conditioned room features a flat-screen TV, armchair, and private bathroom with bath, shower and free toiletries. There is also a refrigerator and electric kettle. Slippers are provided. Please note that for breakfast inclusive rates, it only includes breakfast for 2 people. Extra charges will apply for more guests. This air-conditioned family room features 2 single beds, 1 sofa bed, flat-screen TV, refrigerator and electric kettle. The private bathroom offers a shower, bath, free toiletries, slippers and a hairdryer. House Rules Hotel Sintra takes special requests – add in the next step! One older child or adult is charged HKD 345 per night in an extra bed. Hotel Sintra accepts these cards and reserves the right to temporarily hold an amount prior to arrival. Rooms were spacious. Bed was comfortable. Very good location. Within walking distance to everything. Nice staff! Can't say there is anything I dislike about the Sintra - it's smallish ( not small ) and so doesn't have a lot of facilities - but gyms and swimming pools etc are not what I stay in hotels for - so that doesn't bother me. I like the location. Very accesible to all. I like about the location of Hotel Sintra. 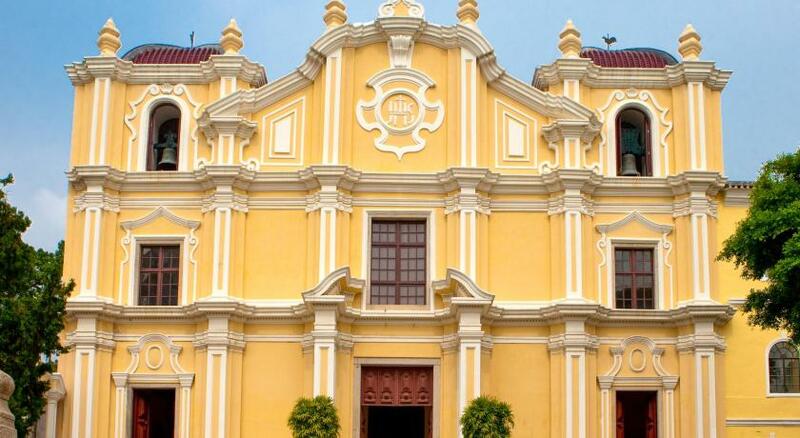 It is very accessible and very near to senado square and st. paul ruins. The hotel instant coffee with hotel bottled water heated in that electric pot made an awful tasting cup of coffee the first time. It had a sour vinegar flavor that was drinkable. Don’t know why. The windows were very dirty. The inner shower curtain was not clean. Security is at a low level since everybody can step in the hotel, take the elevator and arrive at room on any floor since no key card is needed. The hotel charged me the breakfast for the kid which they should not have . What I really, REALLY didn`t like was the fact that the bedrooms have a door inside connecting to the bedroom next door. I mean... We could hear everything the other guests were talking (even in normal tone) or doing. And that, when you are trying to sleep around 11pm and your neighbours are still talking and laughing or have their TV on, is hell. Well, now about the breakfast: the coffee there is instant coffee (Nestlè, ok, could be worst) and not normal coffee. Put some more cheese variety... Thanks! A good variety of food for a complete breakfast... Chinese and american foods are served.